If you ask, “Am I too nice to get a boyfriend?”, the answer is yes. Asking shows you are aware that your disposition might be getting in the way of love. Could I Be Too Nice? Oh yeah, it’s absolutely possible. Let me give you an example from one of my clients who was too nice to get a boyfriend. Anna told me she’s a normal, smart, attractive, 40 something woman with a sense of humor. She’s been dating for years and seems to always encounter the same problem with the men she meets and dates. The men she attracts seem into her at first. They text, email, message on social media or even sometimes call. They ask her out on 2-3 dates, but then they start cancelling or standing her up completely. Still, they stay in touch from time to time and ask her out and she hangs in there hoping things will work out. However, they usually never go on a date again or a lot of time goes by between dates. This frustrates Anna and she’s tired of it. Who can blame her? Why do men always treat her this way? 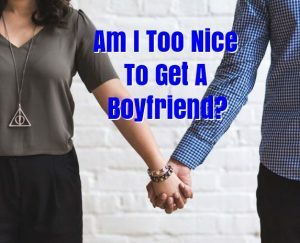 This leads her to wonder, “Am I too nice to get a boyfriend?” Let’s look at this situation a little deeper to gain clarity for Anna and for you too. What Does Being “Too Nice” Mean? The trouble starts early on when a man first shows signs of not being respectful. Anna is a forgiving and understanding person, so she tends to overlook questionable behavior. She accepts excuses like a man being busy at work or needed by a friend. Does that make her a good person? Not exactly. What does being nice get her in this situation? Not the guy! If you want to find love, you have to eliminate men who are sure to waste your time. To do that, you must be able to identify who these men are more quickly rather than waiting around and hoping. The first two dates with Jack were wonderful. He seemed into her and said sweet things like, “You are exactly what I’m looking for in a woman.” She took that to mean he was serious about getting to know her. Jack asked for a third date, then cancelled 30-minutes before getting together because he decided to hang with his buddies. Anna admitted she often gave men the benefit of the doubt multiple times. Is she too nice to get a boyfriend? Yup, she sure is. Don’t get me wrong, I’m not saying she should have yelled, given him a piece of her mind, caused a scene or called him on his stuff. A lot of women go this route and that will not work either. A man is who he is and you cannot change him. Being patient and nice won’t change him either. Instead, what Anna needs to set the bar higher for the men she dates. She also needs to REALIZE when a man is inconsiderate that should automatically eliminate him from having any potential as her boyfriend. Is it right to make this snap judgement if he did this only one time? Maybe not. Anyone can mess up one time. But not more than once. And in this particular case, Jack chose to be with his friends instead of keeping his commitment to go on a date with Anna. That is not a real excuse like getting stuck in traffic or having to work late. It’s just a selfish choice. Anna needs to know she deserves to be treated with consideration and kindness. Yes, there are times when you will need to be understanding, because anyone can make a mistake or have something come up. Trouble is, Anna allows men to treat her without respect multiple times. That’s more like being a doormat. Sadly, Anna puts up with guys repeatedly asking her out and cancelling or showing up late. Jack also got something for himself to eat at an event and didn’t ask if she wanted anything. That’s just rude! Jack should be off her list of suitors. Kick him to the curb girlfriend! If Anna were to ask, “Am I too nice to get a boyfriend?” we would all say yes at this point. The best way for her to react is to recognize he’s not worth dating. Then she can block him on her phone, unfriend him on social media and move on. There are better men to date for Anna and for you too. When Is Being Nice Appropriate? After being with my husband for 20 years (18 years married) I am happy to say it always pays to be nice to him. Trust me, when I’m in a bad mood and he doesn’t listen to me (like all couples – haha) I do NOT want to be nice. But I have found common courtesy as a powerful method to maintain respect each other. Respect is essential for long-term compatibility and happiness. So, yes, I’m nice most of the time and thankfully he’s nice too. We still say please and thank you and show appreciation for the little extras rather than expect them. The difference is, I know my man is worthy of this effort. He was nice to me from the start and so it’s easy to be nice right back. Basic courtesy is always appropriate! On the other hand, being nice when a man treats you poorly is not necessary or appropriate. That’s where you need to value yourself and set firm boundaries. There’s no need to put up with any poor treatment or behavior in the hopes a man will change. He’s showing you who he is right now, so move on if he’s not nice to you! Any time you might find yourself wondering, “Am I being too nice to get a boyfriend?” you now know you are in trouble. 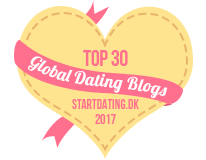 Anna has set an intention to keep firmer boundaries and let go of men faster who don’t treat her well. That means she’s on the road to dating better men and finding lasting love. Am I Too Nice to Get a Boyfriend? So if you find yourself wondering about a new guy you are seeing, and questioning if you are too nice to him, ask yourself how he’s treating you. If he’s kind, considerate and keeps his word – great! But if he cancels last minute, never follows through or can’t keep a promise, dump him and move on. That’s the best way to avoid a broken heart and more bad treatment that’s sure to follow. 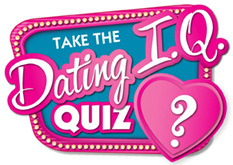 If you are sick and tired of trying to figure out what’s going wrong with your love life, let’s talk. Schedule your complimentary session and let’s see if coaching can help.